This article is about the Irish writer. For the Quantum Leap character, see Sam Beckett. For the vessel of the Irish Naval Service named for Beckett, see LÉ Samuel Beckett (P61). Samuel Barclay Beckett (/ˈbɛkɪt/; 13 April 1906 – 22 December 1989) was an Irish novelist, playwright, short story writer, theatre director, poet, and literary translator who lived in Paris for most of his adult life. He wrote in both English and French. Portrait of Samuel Beckett by Reginald Gray, painted in Paris, 1961 (from the collection of Ken White, Dublin). Some of the best-known pictures of Beckett were taken by photographer John Minihan, who photographed him between 1980 and 1985 and developed such a good relationship with the writer that he became, in effect, his official photographer. Some consider one of these to be among the top three photographs of the 20th century. 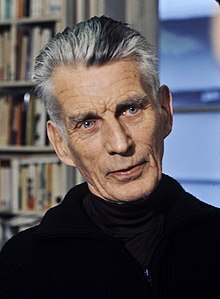 It was the theater photographer John Haynes, however, who took possibly the most widely reproduced image of Beckett: it is used on the cover of the Knowlson biography, for instance. This portrait was taken during rehearsals of the San Quentin Drama Workshop at the Royal Court Theatre in London, where Haynes photographed many productions of Beckett's work. An Post, the Irish postal service, issued a commemorative stamp of Beckett in 1994. The Central Bank of Ireland launched two Samuel Beckett Centenary commemorative coins on 26 April 2006: €10 Silver Coin and €20 Gold Coin. ^ "Fathoms from Anywhere - A Samuel Beckett Centenary Exhibition". ^ Muldoon, Paul (12 December 2014). "The Letters and Poems of Samuel Beckett". The New York Times. Retrieved 13 December 2014. ^ "The Nobel Prize in Literature 1969". Nobelprize. 7 October 2010. Retrieved 7 October 2010. ^ "Samuel beckett -1906-1989". Imagi-nation.com. Retrieved 12 December 2013. ^ "Samuel Beckett". Wisden Cricketers' Almanack. Cricinfo. Retrieved 6 March 2011. ^ Rice, Jonathan (2001). "Never a famous cricketer". Wisden. Cricinfo. Retrieved 6 March 2011. ^ Colangelo, Jeremy (2017). "Nothing is Impossible: Bergson, Beckett, and the Pursuit of the Naught". Journal of Modern Literature. 40 (4): 39. doi:10.2979/jmodelite.40.4.03. Retrieved 14 March 2018. ^ C. J. Ackerley and S. E. Gontarski, The Grove Companion to Samuel Beckett (New York: Grove Press, 2004), 108. ^ The notes that Beckett took have been published and commented in Notes de Beckett sur Geulincx (2012) ed. 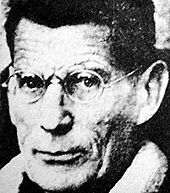 N. Doutey, Paris: Les Solitaires Intempestifs, ISBN 978-2-84681-350-1 and Arnold Geulincx Ethics With Samuel Beckett's Notes, ed. H. Van Ruler, Brill Academic Publishers ISBN 9789004154674. ^ This character, she said, was so looed by apathia that he "finally did not even have the willpower to get out of bed"; quoted in Gussow (1989). ^ "Lettres - Blanche - GALLIMARD - Site Gallimard". www.gallimard.fr. ^ "The Modern Word". The Modern Word. Archived from the original on 17 August 2014. Retrieved 12 December 2013. ^ Samuel Beckett, as related by James Knowlson in his biography. ^ a b Knowlson (1997) p352–353. ^ Bair, Deirdre (1982). Weintraub, Stanley (ed.). "Samuel (Barclay) Beckett". Dictionary of Literary Biography. Detroit: Gale. 13. Retrieved 9 October 2018. ^ Irish Times, 18 February 1956, p. 6. ^ Ackerley, C.J. ; Gontarski, S.E. (2004). The Grove companion to Samuel Beckett : a reader's guide to his works, life, and thought (1st ed.). New York: Grove Press. p. 622. ISBN 0802140491. ^ "''Happiest moment of the past half million: Beckett Biography''". Themodernword.com. Archived from the original on 17 August 2014. Retrieved 12 December 2013. ^ Foster, Roy (15 December 2011). "Darkness and Kindness". The New Republic. Retrieved 5 December 2011. ^ "Jack MacGowran - MacGowran Speaking Beckett". ^ "Big City Books - First Editions, Rare, Fanzines, Music Memorabilia - contact". Archived from the original on 24 January 2016. ^ Cited in No Author Better Served: The Correspondence of Samuel Beckett and Alan Schneider (ed. Maurice Harmon, Cambridge: Harvard University Press, 1998), 442-443. ^ "Charlie Kaufman interview: Life's little dramas". Scotsman.com. Retrieved 8 March 2017. ^ 1998 The Royal Academy Magazine, the "Image of the century"
^ "Photographer John Haynes's website". Johnhaynesphotography.com. Retrieved 17 March 2014. 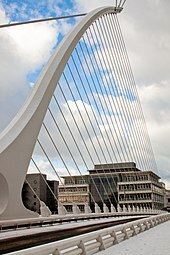 ^ "Samuel Beckett Bridge opens". ^ Slater, Sasha. "Going to the Opera". Sophie Hunter Central. ^ "Samuel Beckett's old school ties". The Irish Times. ^ "Beckett Festival: Happy Days are here again". Belfast Telegraph. ^ "Samuel Beckett, In Our Time – BBC Radio 5". BBC. Retrieved 22 December 2018. ^ "Samuel Beckett: An Inventory of His Papers in the Carlton Lake Collection at the Harry Ransom Humanities Research Center". norman.hrc.utexas.edu. Retrieved 3 November 2017. ^ "Peter Snow: A Preliminary Inventory of His Collection of Samuel Beckett's at the Harry Ransom Center". norman.hrc.utexas.edu. Retrieved 3 November 2017. ^ "Samuel Beckett Papers (MSS008), 1946-1980 | MSS Manuscripts". archon.wulib.wustl.edu. Retrieved 3 November 2017. ^ (beckettfoundation@reading.ac.uk), Beckett International Foundation. "Beckett International Foundation : The Beckett Collection : Accessing the Collection". www.beckettfoundation.org.uk. Retrieved 3 November 2017. ^ "Samuel Beckett | Manuscripts at Trinity". www.tcd.ie. Retrieved 3 November 2017. ^ "Beckett, Samuel, 1906-1989. Samuel Beckett letters to Herbert Benjamin Myron and other papers, 1953-1985: Guide". oasis.lib.harvard.edu. Retrieved 3 November 2017. ^ "Samuel Beckett: Digital Manuscript Project". www.beckettarchive.org. Retrieved 3 November 2017. ^ "Book of Members, 1780–2010: Chapter B" (PDF). American Academy of Arts and Sciences. Retrieved 29 May 2011. ^ a b "Playwrights and their stage works". 4-wall.com. Retrieved 17 March 2014. ^ "Introduction" to The Complete Short Prose: 1929-1989, ed S. E. Gontarski. New York: Grove Press, 1995, p. xiii. ^ "Introduction" to The Complete Short Prose: 1929-1989, p.xiii-xiv. ^ "Introduction" to The Complete Short Prose: 1929-1989, p. xiv. Fleming, Justin (2007). Coup d'État & Other Plays, Burnt Piano. Xlibris[self-published source]. Wikimedia Commons has media related to Samuel Beckett. ^ Knowlson, James (1996). Damned to Fame: The Life of Samuel Beckett. ISBN 9780684808727. This page was last edited on 25 April 2019, at 19:28 (UTC).